When your mind is tangled with anxious thoughts you can easily find yourself overwhelmed, frustrated, and just not feeling like yourself. 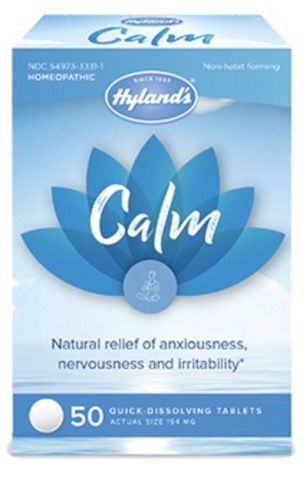 Regain a sense of peace and let your worries melt away with Hyland’s Calm, a safe, gentle and effective relief of anxiousness, nervousness and irritability. Hyland’s Calm eases the symptoms of stress with a non-habit forming and non-drowsy formula that provides natural relief of anxiousness to help restore a sense of tranquility and settle your mind. Calm, part of Hyland’s Harmony suite of products designed to keep your days and nights in harmony. Uses: Temporarily relieves the symptoms of restlessness, anxiousness, nervousness, and irritability. Directions: Adults & Children 12 years and over: dissolve 1-2 tablets under tongue 3 times per day. Sudden onset: every 15 minutes for up to 6 doses. • If you have a known allergy to any ingredient in this product.